Is Your Garbage Disposal Dead? We all take the garbage disposal for granted, we just dump and pour food (and other items) down our kitchen sink and assume it will all disappear when we flip the wall switch. Typically homeowners just rinse their dinner plates right into the disposal and don’t realize that they could be damaging it. The last thing you need is a kitchen sink that won’t drain properly, so call Streamline Plumbing today if you have any questions. Does Your Garbage Disposal Seem Clogged? 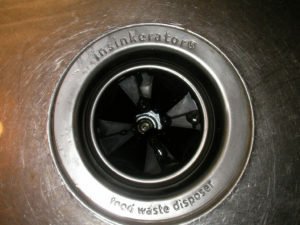 A very common issue for homeowners is then the garbage disposal gets jammed. A potentially fast fix is to just press the “reset button” which is located on the bottom of the disposal. If this doesn’t fix the issue, then you might have to unplug the power supply and look down into the disposal (with a flashlight or whatever). Contact us before the issue become a bigger plumbing repair. A disposal can become inoperable when something like a bottle cap or a coin accidentally gets put down the drain, if you see something you can try to remove it with pliers, but your best move might be to call Streamline Plumbing so we can fix the problem correctly. Most importantly, don’t break something else while you attempt to fix the disposal problem yourself. Many times a quality garbage disposal will last you 5 to 10 years (depending on use), but it’s pretty common that repair issues will arise once in a while. Sometimes it’s not worth fixing a disposal, as it can be cheaper to just install a new garbage disposal. For all repair or new installation questions just call Streamline Plumbing today and we’ll fix your disposal today, or simply install a new unit. With over 25 years of experience helping families in Orange County and Los Angeles, Streamline has become a trusted brand here in Southern California. As a family owned and operated plumbing company we focus on the Homeowner to ensure our customers are Always satisfied with our work. We are licensed and insured, professional and affordable, and most importantly we offer the experience to make sure we get the job done right the 1st time. We also offer Free 2nd opinions even for simple fixes like a broken garbage disposal. For any Questions please call us today, no job is too small or too big.